Ever heard of a fat caveman? Today's dieters should follow their ancestors' lead, proclaim the authors of this update to their bestselling original. For hundreds of thousands of years, the human diet consisted of unrefined foods that were high in fiber, low in sugar and low on the glycemic index. Eating similarly now--avoiding white flour, white potatoes, white rice, sugar, soft drinks and highly processed foods in general (the""basic principles"" of a diet that's been""field-tested by the human digestive system throughout the eons"")--will help people lose weight and keep it off, the authors argue. Their reasoning is sound (high blood sugar triggers the release of insulin, the""fat-storage hormone"" and the""CEO of metabolism""; the less the body lives in fat storage mode, the better), and the lifestyle they propose is simple (though it goes beyond just chucking the 5-lb bag of Domino into the trash). Try eating six small meals a day, don't eat after 8 p.m.; read the labels of all breads and cereals to find the hidden sugars and stock your refrigerator with vegetables and lean meats, the authors say. 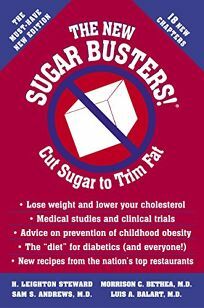 In chapters that are straightforward and focused, the authors consider childhood obesity and diabetes, discuss artificial sweeteners and alcohol, offer recipes from restaurants around the country and answer FAQs from Sugar Busters everywhere. For those with the willpower to cut out the convenience foods, this will be a helpful guide to eating better.